The glass used in these early instruments was of very poor quality and chromatic and spherical aberration worsened the images. Despite this astronomers continued to press for ever more powerful instruments. Before the invention of mirror lenses and the perfecting of the reflecting telescope, the only way to improve the actual telescope seemed to be to increase the focal length. 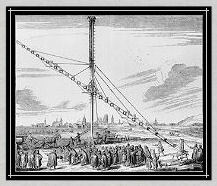 The result was tubes so long they threatened to bend under their own weight and supports that became increasingly unstable; tubes were built over thirty metres long, up to Hevelius's gigantic telescope (focal length 45 metres) and the so-called "aerial telescopes" (over 60 metres), achieved by simply placing the object lens in an elevated position and collecting the image in the eyepiece, without using tubes. All at the expense of using these long instruments reasonably. 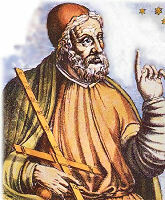  from the Astronomical Observatory of Bologna article "Telescopes"
The most outstanding contribution in early optical science came from the experimental research work of the Egyptian Abu Ali Hasan who described the power of magnification and the refraction of light in his treatise entitled Kitab-al-Manadhir. This work, which contained seven essays on optics, was known as the Opticae Thesaurus, and it had a great influence upon Western thinking, seeing wide usage as a reference source by many European scientists, including Roger Bacon and Johannes Kepler. By the mid Fourteenth century, the European spectacle industry could boast of having a fairly stable market amongst the well-educated, very rich and influential noblemen as well as the extremely well-read Italian clergy. This trend, started in Pisa was, by the Fifteenth century, a well entrenched market in Florence, a city that took the led in innovation, production, sale, and the spread of spectacles within and outside of Italy, and though the lenses were at the heart of future telescopic technology, there seems to have been little to no further development or application of the optics in this direction until the very late Sixteenth or early Seventeenth centuries. In Holland, early in the Seventeenth century, an optical instrument was unveiled which could magnify objects that were off in the distance, whether it was land or sky. Though it has been debated, credit for the telescope's invention is given to Hans Lippershey (c.1570-1619) of Holland (seen left), who applied for a patent to the States General of the Netherlands for such a device in 1608. While little is know of Lippershey's early life, he was a German-born spectacle maker who settled in the south-western city of Middelburg, the Netherlands in 1594, becoming a citizen of that country in 1602. As to the invention of his telescope, while several anecdotes regarding the process of his discovery exist, what Lippershey did was to set two lenses in line to one another, finding that this combination produced an image that was much magnified. It wasn't long before he placed the two lenses in a tube in order to make it easier to use and hence, developed the first version of a telescope. Lippershey called his invention a "kijker", meaning "looker" in Dutch and in 1608, applied for a patent on the device with the States General. Shown at right is the Minute Book of the States General of the Netherlands showing the Patent Application of Hans Lippershey and dated 17 October 1608. 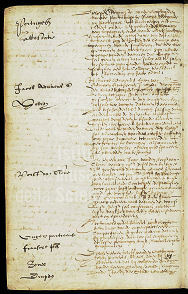 Courtesy Algemeen Rijksarchief, The Hague, MSS "Staten-Generaal," Vol. 33, f. 178v. Copyright, Algemeen Rijksarchief. Within weeks of learning of Lippershey's presentation before the Dutch Government one Jacob Metius of Alkmaar also followed suit and applied for a patent regarding his own invention, one which was similar to Lippershey's, describing his device as "seeing faraway things as though nearby". While little is known of Metius' life, it has been said that upon his death the tools of his trade (instrument-maker and optician) were destroyed according to his last wishes. 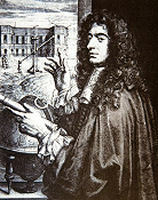 Apparently his request was so that no other could claim the invention of the telescope as his own. In any event, both Lippershey and Metius were denied patents on the grounds that the new device could not be kept a secret, being too easily copied. In the end, while the States General of the Netherlands awarded a small amount of funds to Metius for his device, it was Lippershey's whom they favored. Shown at left is another page from the Minute Book of the States General of the Netherlands showing the patent application of Jacob Metius, also dated 17 October 1608. Courtesy Algemeen Rijksarchief, The Hague, Mss. Staten-Generaal, Vol. 33, f. 178v, see above. Little did anyone then suspect just how much the little "curio" was about to change centuries old scientific knowledge, shake the foundations of dogmatic beliefs and confirm to the individual who decided to point the device skyward, that the world and indeed, the universe, did not work as the majority thought it did: with the telescope, the Age of Galileo had literally arrived. 1. While various archaeological surveys have found numerous samples of polished quartz, there has been little evidence to show that they were used as a means of improving vision. The oldest lens artifact is the Nimrud lens, which is over three thousand years old and dating back to ancient Assyria. The writings of Pliny the Elder (2379 A.D.) also show that burning-glasses were known to the Roman Empire and mentions what is arguably the earliest use of a corrective lens: Nero was said to watch the gladiatorial games using an emerald. 2. 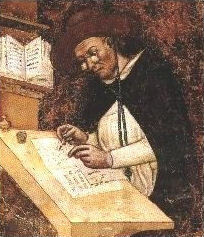 This is the same Jordan of Pisa or Giordano da Pisa (c. 1255  19 August 1311) who was a Dominican friar and preacher of some note and reputation; he is also known by the name Giordano da Rivalto. Jordan studied the use of preaching for evangelisation. He pioneered the use of the Tuscan language for preaching and lecturing, which helped establish it as the foremost among the vernaculars of Italy He was said to have preached five times a day and many notes, written by those in attendance, have survived. See also: B. Giordano da Pisa, O. P., (d. in 1311) CATHOLIC ENCYCLOPEDIA: Pisa, listing the natives and persons of the Archdiocese of Pisa. 3. It is both interesting and relevant to note that a third possible claimant to the telescope's invention was one Sacharias Janssen who was away at the Frankfurt Fair trying to turn his model into cash. This seems to be the same "Dutchman" that attempted to sell his device to Philip Fuchs von Bimbach for such a tremendous price that its purchase was declined. It is also the very same device that von Bimbach described to the German scientist Simon Marius. 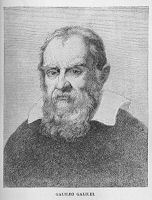 See The Galileo Project at Rice University and compare to source reference  below: Louis Bell, The Telescope pp.45. About ten months ago a report reached my ears that a certain Fleming had constructed a spyglass by means of which visible objects, though very distant from the eye of the observer, were distinctly seen as if nearby...A few days later the report was confirmed by a letter I received from a Frenchman in Paris, Jacques Badovere, which caused me to apply myself wholeheartedly to investigate means by which I might arrive at the invention of a similar instrument. Drewry, Richard D., Jr., M. D. What Man Devised That He Might See Article was converted to HTML by: Ted Wei, Jr., M.D. Copyright (c) 1994-2001, accessed Nov. 2009, one page. Bell, Louis Ph.D. The Telescope, 1922 1st. edition. p.2 The Internet Archive, NATURAL SCIENCES; Astronomy. Astrophysics. Space research.Geodesy; Astronomical instruments and techniques, copyright 1922 McGraw-Hill Book Company Inc. Era of Early Refractors Hevelius' Refractors. Quotes regarding Johannes Hevelius are from the chapter entitled Telescopes from the Ground Up, part of the Amazing Space educational website: the Formal Education Group of the Space Telescope Science Institute's Office of Public Outreach., Nov. 2009. Material used is in the public domain in accordance with NASA's contract (NAS5-26555). Messier 42 Observations and Descriptions from the SEDS (Students for the Exploration and Development of Space) website; Hartmut Frommert and Christine Kronberg. Last Modification: March 16, 2006, accessed November, 2009. Mee, Arthur, b. 1860 The story of the telescope. With lists of the principal telescopes, observatories, astronomical societies, periodicals and books, and a chronological summary p.12 Published by the Author at Llanishen, Cardiff, 1909. Made available through the online Digitizing sponsor: MSN. Book contributor: University of California Libraries. Copyright: not visible or out of copyright term. History of Telescope, How Telescopes Improved One page article. Source: public information provided by JPL/NASA. Accessed Nov. 2009. Bardell, David The Invention of the Microscope Bios, Vol. 75, No. 2 (May, 2004), pp. 78-84 (article consists of 7 pages) Published by: Beta Beta Beta Biological Society. Eyeglasses Through the Ages This is a very informitive site with solid information and examples regarding the history of eyeglasses in a Timeline format. Gates of Vienna: A History of Optics, Part 3 by Baron Bodissey, Thursday, January 08, 2009. Bobis, Laurence and Lequeux, James Cassini, Rømer and the Velocity of Light Journal of Astronomical History and Heritage, 11(2), 97-105 (2008). Unless otherwise stated, all images, screen shots, electronic materials including instructional, software, scripts and web pages referred to herein or incorporated by reference are copyrighted © A Universe in Time. None of the content herein may be reproduced or copied in any manner from this website without the prior written permission of above indicated copyright holder(s). All images and orginal works of the author(s) used within the above or foregoing web pages are for the sole purpose of information and display at A Universe in Time website and have been used with the kind permission of the respective owner(s).